So I will make a nice army blog at some point soon when I get back to the UK. 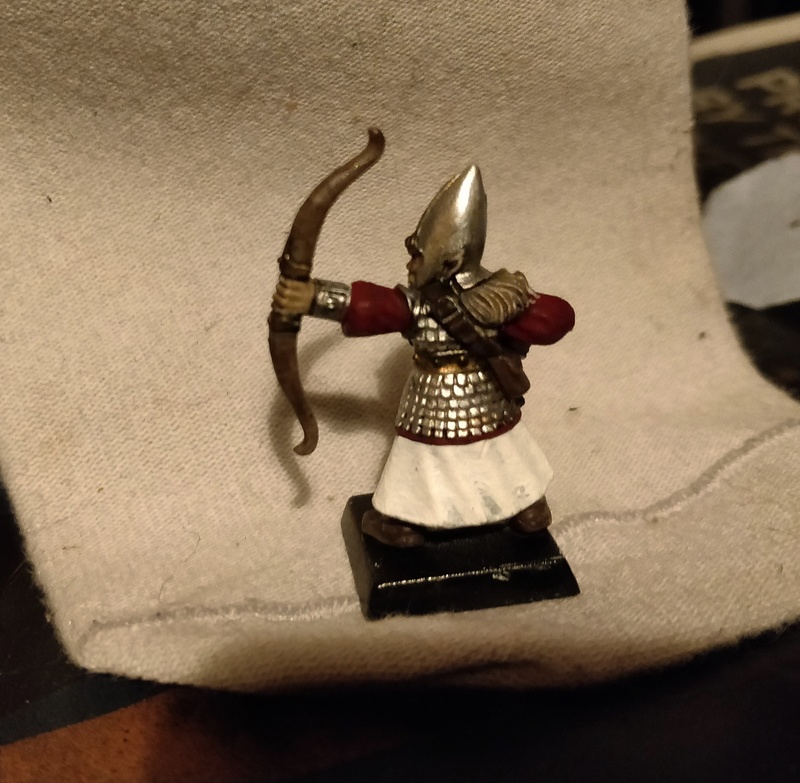 I took a terrible mobile pic at night of the archer I painted up to test the colour scheme so I thought I'd share it. It's purposefully quite a dark scheme but I think when they're all regimented it will look nice. Do excuse the paint job as I've not really picked up a paintbrush outside of work in like 10 years. I'm not quite sure on the basing but I'm thinking of them coming from the north of Ulthuan, possibly Chrace, so dark forest and snow. 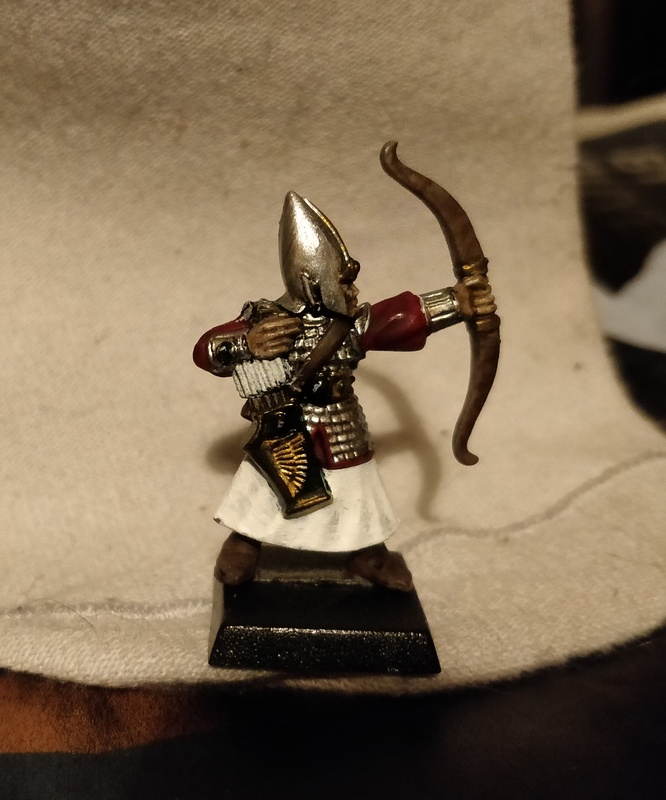 Since that picture I gave the armour another black wash to better shade the mail. Anyway some feedback would be lovely! It's hard to be sure what's going on because of the picture quality. I think red is a good choice. What kind of paints are you using? In a couple spots it almost looks like glossy enamels, or that you are using really thick paint- perhaps the ones you had years ago and they have dried out some. Or maybe it's just some black ink in places that will be painted over anyway. What you have going with the armor itself is promising. It is indeed a bit hard to tell with the quality and the size of the pictures. Try resizing them a bit, somewhere between 600 and 800px wide (or high) is usually a good choice. I'm guessing the place where you host the images has such an option. Otherwise, there is a couple of pc tools that can do it for you as well. But I think you have a good basis to work of there. The paint indeed looks a bit thick. Try thinning it down with water a bit. People usually say to aim for a milk like consistency. But I never really figured out how that looks. I just thin it before putting it on until it flows nicely but still covers what I want to paint in one or two coats. I like the dark red, black and gold. They work nicely together. For the base I would suggest to try out a couple of things to see what works. Snow could be nice, but there you should see how it goes together with the white robes. Sometimes it can either make one of the two look dirty or it can make the model or base "fade" a bit if there isn't enough contrast. Still, it could work and it should be fun to do I think. Hi, thanks for the replies. I'm hoping it's just the photo that's giving the impression of the thick paints or gloss, the reality is a lot more subtle? I've always been in the habit of doing multiple thin coats so I'd hope it wasn't the issue here. The black of the quiver is only because of my limited paints. I'm using mainly Vallejo colours but don't have many available. I was hoping to pick up something which would provide a nice contrast to the rest of the scheme. I agree with what you mean with the snowy bases, all my older armies I picked bases that would allow the model to 'pop'. But at this stage I'm happy to test out things and see how it looks. I'll be back from Nepal in a few days so I'll hopefully paint up something later and get better photos. What are people using for an image sharer? I use imgur for the image sharing. I used to use photobucket, but they went crazy and intentionally made that not work (though I think they've fixed it) so I had to make a switch. Of course imgur has it's own issues lately. I like the dark red, black and gold. Me too, deep and moody. Same here. I find Imgur’s mobile app at least awesome. I'm just using Onedrive (the Mircosoft cloud storage thingy). Basic, but photo's from my phone end up there automatically, sharing is an easy click of a button and they simply set the resolution for the photo in the share link. I tried photobucket (until they indeed decided to intentionally break their own service). Which worked fine, but was a lot slower, with a lot more adds and now I'm sure I'm in control of my own photo's. It's very possible that the paint appears thicker because of a combination of large photo and close-up and perhaps not the best lighting in the picture either. I wouldn't worry too much over a limited color palet. Part of that forces you to be more creative and it helps create a uniform look for your army. Also, which is what I did, once you have the basic colors for your army, you can just add one or two colors when you start a new unit. That way you slowly build up your paints without having to get a mortgage to get all of the paints you could possibly need at once. And it makes sure you only get colors you'll use, even if only once. I wouldn't worry too much over a limited color palet. Part of that forces you to be more creative and it helps create a uniform look for your army. Also, which is what I did, once you have the basic colors for your army, you can just add one or two colors when you start a new unit. Got to say, I like the colors you've picked for your army. A deep, dark red mixed with black (maybe dark brown) will most certainly look well on snowy as Spires did mention before. You could even go with light blue ice as bases. Crimson and ice blue look quite fitting when combined together, but's just my 2 cents on the matter. Red+white is a quite versatile combo and can go with pretty much any basing so I'm sure that whatever you pick will look grand.